Millennia 2015 Report (December 7, 2015) on DKo44 CMT Study and letter (April 29, 2016) from the Archaeology Dept. appear below. Good evening and welcome to everyone here tonight. We wish to acknowledge, with gratitude, that we are meeting on Sechelt First Nation Traditional Territory and that the study area of the Conservation Review is located on Sechelt and Squamish First Nations Traditional Territories. The study area is located above the residential areas of Roberts Creek between the Town of Gibsons and the District of Sechelt. The 1500ha area was identified as an environmentally important site in The Land for Nature Project initiated in 1995. 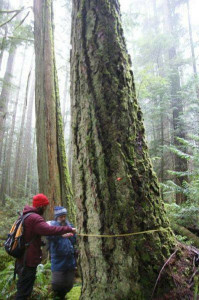 The 1500ha Park / Protected area proposal is included in the recently adopted Roberts Creek Official Community Plan. The area is also identified as a Community Interface Zone by the Ministry of Forests. Logging activity in the 1500ha area has been very controversial. 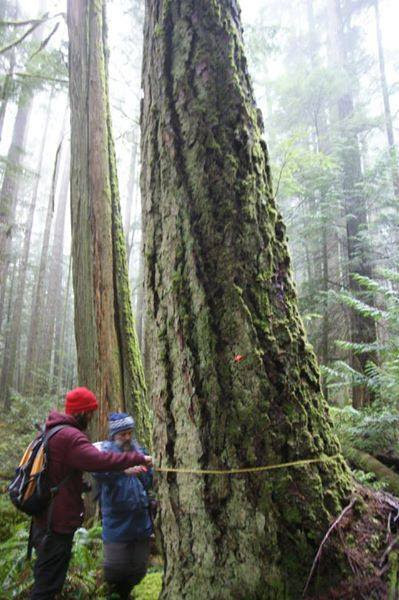 In 2012, the logging of block A87124, by the old Wagon Fest Trail, by BC Timber Sales (BCTS) and blocks EW 001 and EW 002, the Wilson Creek Forest, by the Sunshine Coast Community Forest (SCCF) resulted in a number of roadblocks, injunctions and finally in over a dozen arrests. “That the concept of a scientific study of the 1500ha of the Elphinstone Forest be supported in principle and that support be conveyed to the Provincial Government”. In a letter to the Minister of Forests and the Minister of Environment the SCRD asked the Ministers to “advise their staff to initiate a discussion with our community and Regional District staff to explore how a study would proceed”. We still haven’t heard back from them! In the fall of 2014 funding became available from a generous donor and we decided to proceed with the study. We were fortunate to make contact with Wayne McCrory and he agreed to do a Conservation Review of the area. Wayne conducted field studies, compiled and analysed existing data and has now completed a break-through report on our Elphinstone forest. He makes a compelling case for protection of this unique area. Click Link below to view Research Report.